Never text and drive: we all know it’s the number one rule of road safety these days. But when it comes to staying safe and getting the most out of your drive, your smartphone could be a help rather than a hindrance. From vehicle performance to gas prices and everything in between, there’s now an app for that. We’ve sifted through dozens of iOS and Android apps and narrowed it down to the best of the best for our neighbors in Arkansas. Buckle up and visit the App Store to download these great, driver-friendly tools (just don’t use them while you’re driving). 1. iOS 11 – Do Not Disturb While Driving – Are you struggling to keep your eyes off your phone while you drive? Look no further than the latest Apple software update, iOS 11. This new Do Not Disturb feature is designed to cut down on accident-causing distractions by muting incoming texts, calls, and notifications while you’re driving. There are several options for activating this feature: set it to turn on manually, automatically when the iPhone detects a car’s acceleration, or when an iPhone connects to Bluetooth in a car. You can even change the settings to send an automatic text reply, such as “I’m currently driving but will read your message when I reach my destination,” so that your friends and family will know their message was received. Price: Free. 2. Waze – Waze is the world’s largest community-based traffic and navigation app. It uses crowd-sourced real-time updates from local drivers to give you the most up-to-date driving information. Waze can alert you before you approach accidents, road hazards, and traffic jams, and it will seamlessly re-route around all of it. Looking for the best gas prices? Waze can tell you that, too. If you’re serious about finding the quickest route to your destination, Waze is the app for you. Be sure your passenger is the one using it in transit, though. Price: Free. 3. Roadtrippers – Billed as “Yelp for road trips,” Roadtrippers is an app designed specifically for travelers. With thousands of positive reviews in the App Store, Roadtrippers users claim that the app allows them to seamlessly plan a route that encompasses all the best sights of any city. You’ll discover historic locations, scenic views, interesting museums, delicious dining – and hotels within a short distance of all of the above. When you find a great place you can save it, share it with your friends, or get in-app directions to begin driving there right away. Whether you’re taking a cross-country trip or a down-the-road getaway, Roadtrippers will help you make every mile count. Price: Free. 4. 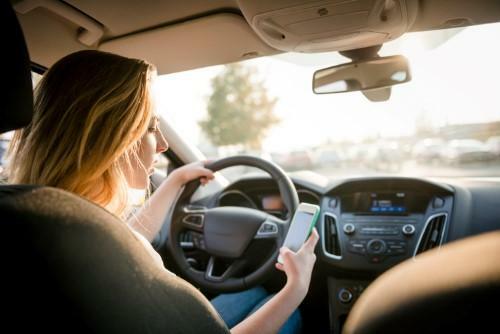 Safe Driver – Parents, if you’re considering handing over the keys to your newly licensed teenager, Safe Driver might be the app for you. It’s intended to monitor the location and driving practices of newly licensed teens. Parents appreciate the alerts they can receive via text or email when their child exceeds a specific speed; the alerts also show where the infraction occurred. While it may not be the most popular app with teenagers, Safe Driver does encourage young drivers to develop healthy driving habits with limited supervision. Safe Driver is compatible with iOS devices. Price: Free; pro version available for $4.99. 5. EverDrive – Another app aimed at encouraging safe driving practices, EverDrive makes driving fun by encouraging friendly competition. At the end of each trip, this free app will show trip summaries, give details on driving maneuvers, and offer useful feedback on that data to help you become a better driver. It automatically detects starts and stops, making it easy to use. You can then compete with your friends, family, and other drivers to improve your driving skills and increase your rankings. Price: Free. Stay tuned for Part Two of our app roundup. We hope you’ll join us in our commitment to keeping Arkansas roads safe. In the meantime, have you downloaded the new Taylor King app? From uploading photos to pinpointing your exact accident location, our new app keeps clients connected like never before. That’s part of our promise to be On Your Side, By Your Side. If you’ve been injured in a car accident or were the victim of another type of accident, you may have legal rights to compensation for your injuries and losses. Taylor King offers a FREE consultation to anyone who thinks they may have a case; call today at 1-800-CAR-WRECK, visit our website at taylorkinglaw.com, or download the free Taylor King app to begin your evaluation today.